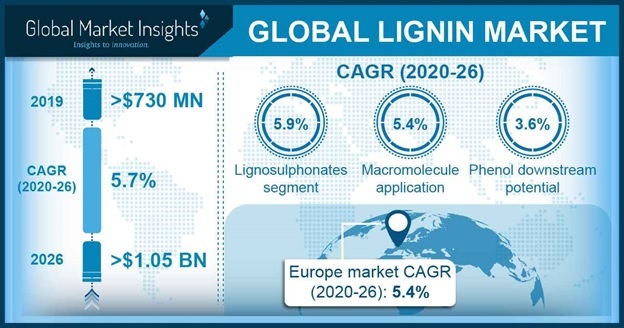 Lignin Market size is set to surpass USD 960 million by 2024; according to a new research report by Global Market Insights, Inc. Growing environmental concerns owing to air pollution along with technological advancement in bioenergy or biofuel will drive lignin market size. Increased usage of concrete admixtures in concrete owing to properties such as water reduction has promoted product demand in construction sector. Widespread application outlook in binders and adhesives have further catalyzed product demand. Favorable regulations by FDA and European Commission pertaining to the usage of lignosulfonates in animal feed will also promulgate lignin market growth. Shift in feed manufacturers concern towards the health of livestock has paved the way for animal industry where meat quality is of utmost significance, thereby enhancing product demand. North America, with steady growth in the U.S. lignin market size should surpass 560 kilo tons during the forecast period. Shifting inclination towards energy efficient building projects along with rising construction spending has resulted into increased product demand in the region. The product is widely used as bio-fuel and supporting guidelines related to the product will further surge industry growth. Aromatic lignin market size will register gains at over 4.5% by 2024. These products are used in the production of phenol derivatives, which finds application in cosmetic and skin care industries. Increased product usage in surfactant, phenolic & epoxy resins and adhesive industries have further enhanced market growth. Wood is the prominent raw material used in the lignin production process. Processing cost along with technological advancement in production processes will hinder lignin market price trend. Complex 3-D heterogeneous chain structure of the product has resulted in low yield of end-use products, which has led to the usage of costly technologies, impacting the overall industry profitability. Low purity lignin market size will surpass USD 800 million during the projected timespan. The product is used as a catalyst in bio-refinery. Superior characteristics including low molecular weight, sulfur free and has a narrow molecular weight distribution along with high availability in economical rates and numerous applications in bio-refinery as feedstock, should catalyze industry growth. France lignin market size will witness steady growth close to 4% during the foreseeable timeframe. Favorable norms by EU Commission pertaining to product usage in animal feed along with improving biotechnological extraction method, and growing demand for biochemical feedstocks may enhance production capabilities in the region. Lignosulfonates market size will exceed USD 95 million by 2024 as it finds application in carbon black, dyes and pesticides. These products can decrease the viscosity of slurry by minimizing the amount of water used in the production of cement, thus driving lignin market demand in construction industries. China lignin market size is likely to register growth close to 6% during the projected timespan. Growing trends towards the development of bio-based materials along with increasing pulp & paper manufacturing industry in China will accelerate product demand in the region. Carbon fiber is used in various applications such as aircraft, pressure vessels, satellites, sports equipment and wind turbine components. High cost of carbon fiber due to expensive polyacrylonitrile (PAN) polymer precursor, has led to an urgency to replace it with lignin, thus enhancing product demand. Key manufacturers in this industry space include Rayonier Advanced Materials, Domtar Corporation, Borregaard LignoTech, Nippon Paper Industries, Ingevity Corporation, Metsa Group, and Burgo Group. Industry players are focusing on R&D to develop and expand product range to cut down the product cost and making strategies such as mergers and acquisitions to strengthen regional presence and size up production capacities.